Electronic systems using light waves instead of voltage signals is advantageous, as electromagnetic light waves oscillate at petaherz frequency. This means that future computers could operate at speeds 1 million times faster than today's. 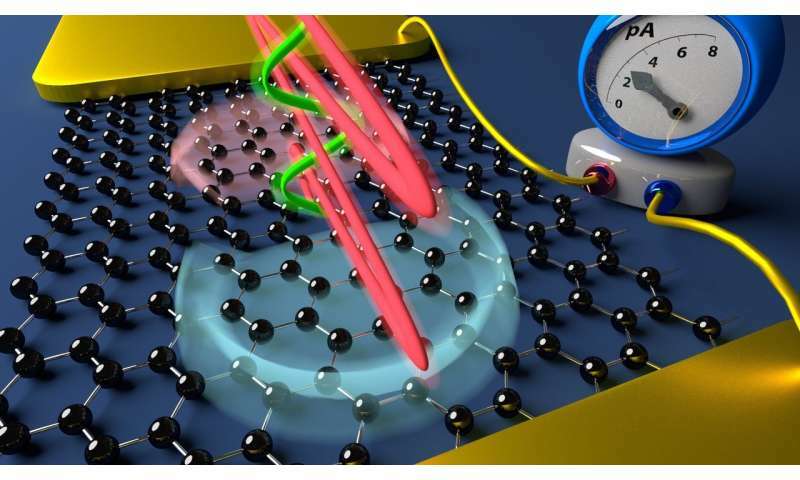 Scientists at Friedrich-Alexander-Universität Erlangen-Nürnberg (FAU) have now succeeded in using ultra-short laser impulses to precisely control electrons in graphene. Current control in electronics that is 1 million times faster than in today's systems is a dream for many. Current control is responsible for data and signal transmission. However, until now, it has been difficult to control the flow of electrons in metals, as metals reflect light waves, which therefore cannot influence the electrons inside the metal conductor. Physicists at FAU have therefore turned to graphene, a semi-metal that comprises only one single layer of carbon and is so thin that light can penetrate and set electrons in motion. In an earlier study, physicists at the Chair for Laser Physics had already succeeded in generating an electric signal at a time scale of only one femtosecond by using a very short laser pulse. This is equivalent to one millionth of one billionth of a second. In these extreme time scales, electrons reveal their quantum nature as they behave like a wave. The wave of electrons glides through the material as it is driven by the laser pulse. The researchers went one step further in the current study. They aimed a second laser pulse at this light-driven wave. This second pulse enabled the electron wave to pass through the material in two dimensions. The second laser pulse can be used to deflect, accelerate or even change the direction of the electron wave. This enables the transmission of information by this wave, depending on the exact time, strength and direction of the second pulse. According to the researchers, it's possible to go one step further. "Imagine the electron wave is a wave in water. Waves in water can split because of an obstacle and converge and interfere when they have passed the obstacle. Depending on how the sub-waves stand in relation to one another, they either amplify or cancel each other out. We can use the second laser pulse to modify the individual sub-waves in a targeted manner and thus control their interference," explains Christian Heide from the Chair of Laser Physics. "In general, it's very difficult to control quantum phenomena, such as the wave characteristics of electrons in this instance. This is because it's very difficult to maintain the electron wave in a material as the electron wave scatters with other electrons and loses its wave characteristics. Experiments in this field are typically performed at extremely low temperatures. We can now carry out these experiments at room temperature, since we can control the electrons using laser pulses at such high speeds that there is no time left for the scatter processes with other electrons. This enables us to research several new physical processes that were previously not accessible." The scientists have made significant progress toward realising electronic systems that can be controlled using light waves. In the next few years, they will be investigating whether electrons in other two-dimensional materials can also be controlled in the same way. "Maybe we will be able to use materials research to modify the characteristics of materials in such a way that it will soon be possible to build small transistors that can be controlled by light," says Heide.